Rahat Bakers or something of the likes of Rahat opened up in Peshawar few months back. The city is kind of low on quality stuff, specially in the food department. There are a few good bakeries like Jan’s Bakery, Pak Bakers etc. But then that’s where the thing stops. I believe this joint is a franchise of the original Rahat, because somewhere it changed to Tehzeeb after years of libel suits. So things became so jumbled up that consumers were confused out of their minds which Rahat was real and which was the imitator. And now we have this Rahat in Peshawar. But that’s not what this discussion is all about. Today’s ramble is about the low quality stuff that this bakery is making and selling, in the month of Ramzan! 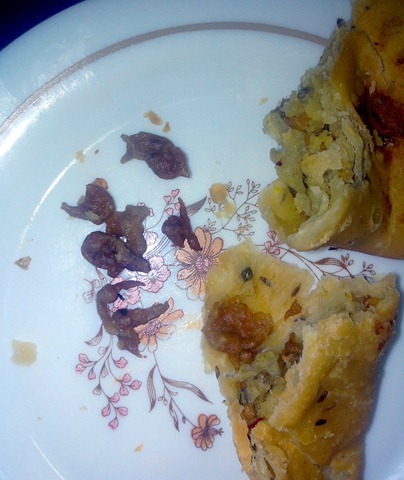 I had the very unfortunate experience of buying samosas for Iftar and boy they turned out to be filled with some junk. On closer inspection I think it is the leftover stuff of Pakoras. The kids refused to eat it and so did my wife. That the cost of all items have been jacked up is another discussion altogether which may require another post. What is even more painful is the fact that a substantial quantity of the Samosas was sent to neighbors and friends for Iftar, just imagine what they might have felt on eating this junk. A few days back I bought some Kachuris from them and surely at least one turned out to be filled with “NOTHING” and the other had burnt stuff filled in to it. Folks, spending a few million rupees to get a shop on main University road, getting a franchise from Rahat, opening a Bakery including a much needed Facebook page is no big feat at all, I say its good businessman acumen. The real thing is making and selling quality stuff and not ripping off customers. I hope the management takes note of this and improve their quality or I will stop going there. See this Samosa! It was filled with some junk. Get a life rippers!